JOHANNESBURG (Reuters) - Workers from South Africa's mainly-white Solidarity union staged a go-slow protest at the petrochemicals firm Sasol on Monday over a share scheme offered exclusively to black staff, and said they would begin a full strike on Thursday. The union said 6,300 of its members would hold a go-slow at Sasol's facilities in South Africa, and then strike on Thursday. "We are not against the scheme, we just want it to be inclusive of all workers. If the company makes it inclusive, the majority will still be black, so we see no need to exclude white workers as this is discrimination," said Dirk Hermann, Solidarity's chief executive. 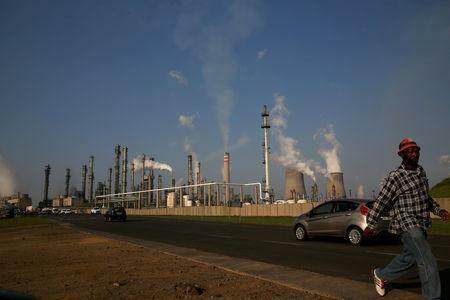 Sasol, which employs around 26,000 people in South Africa, said it was aware of Solidarity's intent to strike, and that it had made contingency plans. Sasol's shares were 1.4 percent lower at 568.14 rand, with the market expecting the dispute to be resolved without affecting earnings. The ruling African National Congress said in a statement that it was concerned by the "obsession with perpetuating racial polarization" triggered by Solidarity's protest. Solidarity's Hermann said the union was not promoting racism and had backed schemes at AngloGold Ashanti and iron ore mining firm Kumba that treated white and black workers equally. Herman said Solidarity had also challenged a similar scheme at South Africa's biggest mobile operator, Vodacom, but had been hampered by its low members' roll at the firm. The Commission for Conciliation, Mediation and Arbitration, which mediates in labor disputes, ruled that Solidarity did not have a legal right to challenge Sasol's scheme in court, but could push its cause through industrial action.